A flour tortilla with rice, beans, cilantro, your choice of protein, American cheese, torta cheese, and lmc's Triple threat aioli sauce. Three deep-fried rolled tortillas stuffed with your choice of cheese, chicken, or pork topped with cheese and cream. 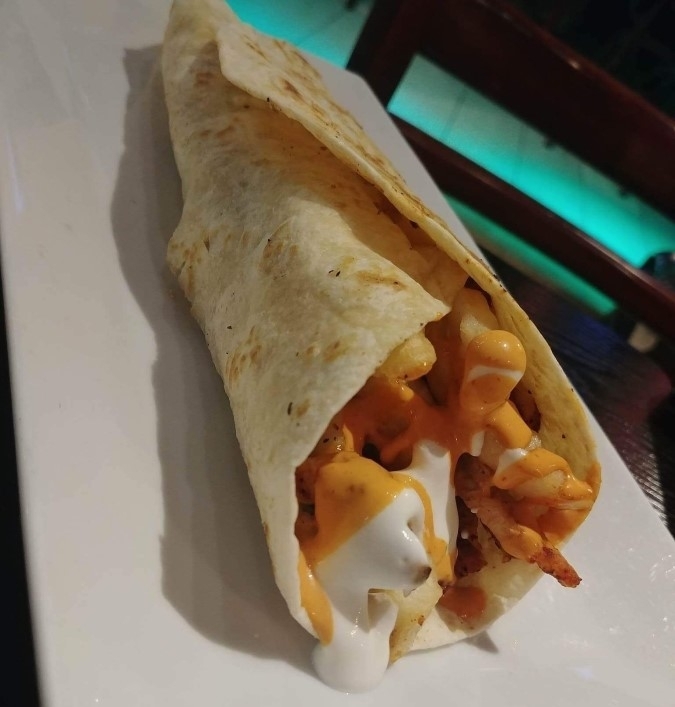 One deep fried burrito covered with cheese, sauce, sour cream and slices of delicious avocado, rice, bean and your choice of chicken, pork or beef. Fried tortillas sauteed in choice of red or green spicy sauce. Served with two fried eggs. Fried tortillas chips sauteed in choice of red or green spicy sauce. Served with two fried eggs. Marinated strips of chicken sauteed with peppers, onions, tomato, and mushrooms. Served with salsa and fresh hot tortillas. Marinated strips of steak sauteed with peppers, onions, tomato, mushrooms served with salsa and fresh hot tortillas. Marinated shrimp sauteed with peppers, onions, tomato, mushrooms served with salsa and fresh hot tortillas. Marinated strips of pork sauteed with peppers, onions, tomato and mushrooms served with salsa and fresh hot tortillas. Marinated strips of chicken, steak, and shrimp sauteed with peppers, onions, tomato and mushrooms served with salsa and fresh hot tortillas. Choose from three delicious kinds of sauces. Red, green or mole stuffed tortillas with choice of cheese, chicken or pork topped with shredded cheese, onion, sour cream and served with rice and beans. Tri color. Two enchiladas served with a chile relleno, stuffed with cheese. Served with rice and beans and fresh tortillas and salsa. Seasoned rib eye steak served with salad, rice and beans, salsa and fresh hot tortillas. Oven roasted pork, served with rice and beans salsa and fresh tortillas. Shrimp sauteed in a special sauce. Served with rice and beans, salsa and fresh hot tortillas. Steak served with one enchilada, guacamole, poblano hot peppers and beans. Oven roasted pork and Mexican sausage and salted beef served with guacamole rice and beans. Grilled steak, chicken, and shrimp. Served with rice and beans. Two chile poblanos, stuffed with cheese or chicken covered in a special egg batter deep fried to perfection served with rice and beans. Tortilla chips topped with beans, cheese, sour cream and chile jalapeno. Fish covered in a special egg batter and deep fried. A mixed platter of mini chimichanga, two mini flautas, Mexican sausage quesada, and nachos. With melted cheese, sour cream lettuce, tomato and avocado. Two flour tortillas with buffalo sauce, shredded chicken cheese, side of guacamole, and sour cream. Flour tortilla covered in bed of beans, lettuce, tomato, cheese, cream and avocado. Seasoned pork, roast pork, steak, chicken and Mexican sausage. Chorizo and potato chicharron in red sauce and beans. Red with cheese and jalapeno, green with pork and mole with chicken. Chicken, rice, avocado, cheese and jalapeno. Seafood Soup. Calamari, clams, crab mussel, octopus, scallops, shrimp and swordfish. Soup of the Day. Please call restaurant for more soup details.